Often having a bad reputation in people's minds, potassium does play an integral role in healthy functioning and should not be cut out entirely. 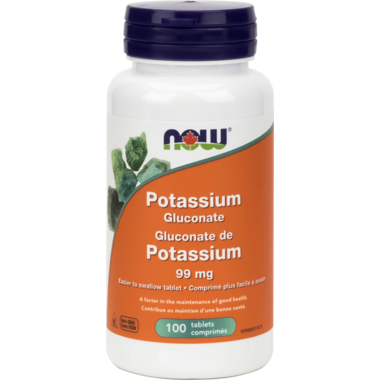 Potassium is an important mineral used in various bodily functions. It is an important factor in the maintenance of the body's acid-base balance and nerve conduction, as well as the transfer of nutrients through cell membranes. Potassium is found in a number of foods, but food processing reduces the levels of naturally occurring nutrients in foods. Supplementation may be necessary to insure adequate intake. Non-Medicinal Ingredients: Cellulose, Stearic Acid (vegetable source), Magnesium Stearate (vegetable source), Silica. Directions: Adult Dosage: Take 1 tablet 1-3 times daily with meals.